The circuit was mounted in a plastic 35MM photographic slide box with a translucent plastic top (not shown). A piece of perforated board was cut to fit inside of the slide box, the LEDs and resistors were inserted through the holes in the board and the wires were soldered together on the back side of the board. 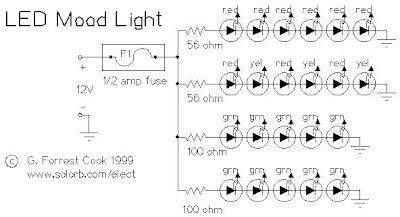 It is recommended that you use a heat sink on the LED leads while you solder them, it is very easy to damage an LED with a soldering iron. A length of speaker wire was used to connect the lamp to the power source. The circuit board was connected to the plastic box with one 6-32 screw and several 6-32 nuts were used as spacers. 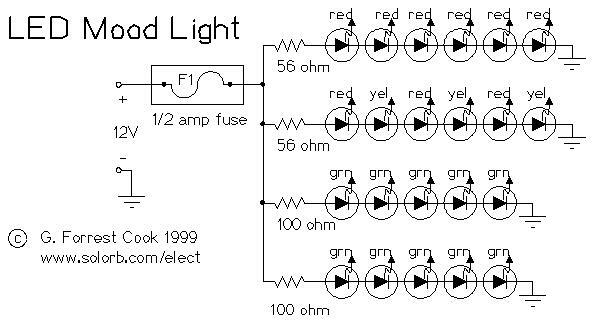 Connect this circuit to a 12V battery or power supply, it puts out a nice glow that won't affect your night vision too much. You can read by this light if you use it at close range.